Secretary-General of the Caribbean Community (CARICOM) Ambassador Irwin LaRocque is paying an official visit to The Bahamas February 13-15. 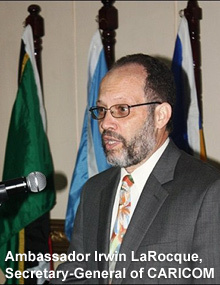 Feb. 13, 2013 (Caricom.org) – Secretary-General of the Caribbean Community (CARICOM) Ambassador Irwin LaRocque is paying an official visit to The Bahamas from Wednesday, February 13 through February 15. On February 14, the second day of his visit, the Secretary-General will meet with the Rt. Honourable Perry Christie, Prime Minister of The Bahamas. Ambassador LaRocque is scheduled to pay a courtesy call on the Honourable Frederick Mitchell, Minister of Foreign Affairs and Immigration. The Secretary-General will also hold discussions with the Honourable Bernard Nottage, Minister of National Security and current chairman of CARICOM Council for National Security and Law Enforcement (CONSLE). As is customary during his visits to Member States, the Secretary-General will also meet with the CARICOM Youth Ambassadors and other youth representatives. This meeting will take place on Thursday, and later that day Ambassador LaRocque will have an open dialogue with representatives of The Bahamas media. The Secretary-General will depart from Nassau on Friday on his way to the 24th Intersessional Meeting of the Heads of Government of CARICOM scheduled to take place in Port-au-Prince, Haiti on February 18 – 19. On February 4, 2013, the Executive Board of the International Monetary Fund (IMF) concluded the Article IV consultation with The Bahamas.